You need to install OpenOffice.org without local administrator rights. Your system administrator has set policies to prevent this installation. 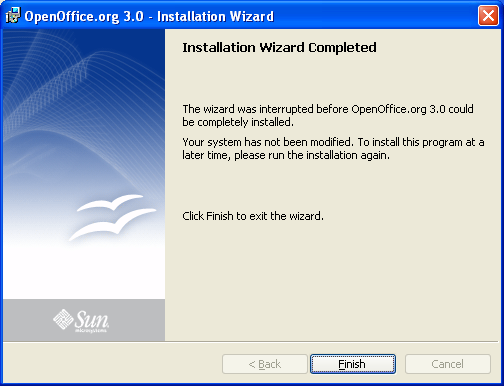 You need to install OpenOffice.org without the system integration (file associations and menu shortcuts). You need to install OpenOffice.org on portable media (such as a USB disk). Roll our own Portable OpenOffice.org! You need to install multiple versions of OpenOffice.org in parallel. For example, you can install and simultaneously run versions 2 and 3. You need to perform a network installation on a server. If none of these apply to you, you may instead wish to use the standard installation. The Nullsoft Installer .exe unpacks several files to a temporary folder on the desktop. Then, it automatically starts the next step. The Microsoft Windows Installer performs the actual installation. A benefit of this system is that the Nullsoft Installer allows a much smaller download while the Windows Installer is Windows' native and preferred installation system (especially nice for installing through Group Policy and Active Directory). OpenOffice.org installs simply without significant registry changes or placing files outside of its Program Files directory: this makes the OpenOffice.org application easy to relocate to different folders—even on different computers. Download OpenOffice.org. Depending on the version, language, and JRE option, the file will have a name like OOo_3.0.1_Win32Intel_install_en-US.exe. 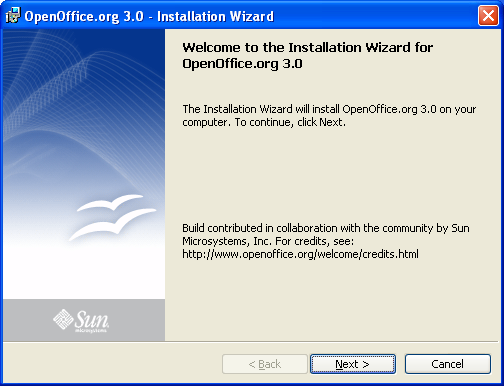 On your desktop, open the newly-created folder which has a name like OpenOffice.org 3.0 (en-US) Installation Files (which varies depending on the OpenOffice.org version). While viewing the folder, click Tools > Folder Options. Click the File > New > Text Document. Name the new file install.bat. 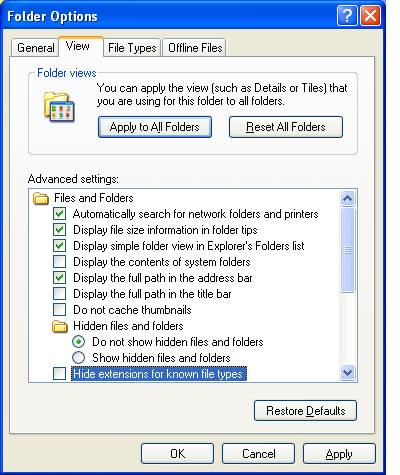 Windows may warns you: "If you change a file name extension, the file may become unusable. Are you sure you want to change it?" Click Yes to accept the warning. Right click on install.bat and choose Edit. NOTE: The filename openofficeorg30.msi may change slightly depending on your OpenOffice.org version. Use the name of whichever filename you actually have. In case Windows is hiding filename extensions, look for the one file with type Windows Installer Package. Run the batch file (by double clicking on it). Follow the instructions in the installation program. If necessary, adjust the installation path. Whichever installation path you choose, add something like OOo to the end of it. For example, instead of just C:\, use c:\OOo to keep all the files organized. Now OpenOffice.org is installed. There are no file associations or menu shortcuts, so you must start the application directly. If you installed it in (for example) C:\OOo, then run C:\OOo\Program\SOffice.exe. Then, there are two ways to open existing documents. Drag the file and drop it on the blank OpenOffice.org window. If you have local admin privileges on computer X but not computer Y, you can use this procedure. Install OpenOffice.org normally on computer X. Copy the OpenOffice.org installation folder (typically something like C:\Program Files\OpenOffice.org 3.0) from computer X to computer Y. To uninstall methods 1 or 2, simply delete the folder with the application. Download and use Portable OpenOffice.org. Did you actually want to do a network installation (also called an administrative installation)? 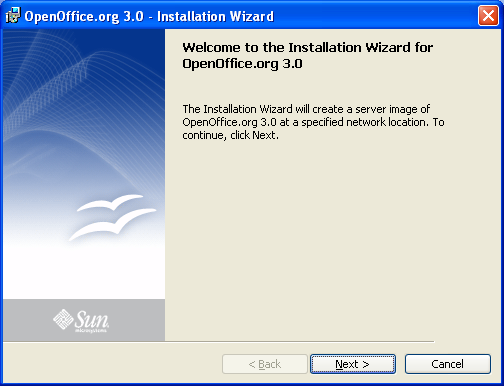 Follow Method 1 (above) to install OpenOffice.org centrally on a server. On each desktop, run the openofficeorg30.msi created in the installation target directory. This step installs the program files locally, registers file associations, creates shortcuts, etc. A silent installation installs OpenOffice.org without user interaction, so it can run unattended from a batch file. Start with the same procedure as method 1 until the point of creating the batch file. Thank you very much for these useful hints! Just a question: what's the "ause" parameter for? Cobo: Oops, I had the 'pause' command in there for debugging, but I am removing it now for publication. I believe you have an error here with the comment about running the msi on the worjkstation to create file associations - oo3never creates any file associations!? Anonymous: Of course OpenOffice.org 3 creates file associations! First, it creates file associations for OpenDocument Format files (odt, ods, odp, etc). I see OOo bug 96594: MSOffice file association has people upset; however, I just ran the silent install on this page, and MSO files (doc, docx, xlsx) are associated. Please (puh-leeze!) do a similar rundown for installing 3 and higher under Ubuntu. I moved to a new computer, and didn't even want the 2.4 that came with my Intrepid install. But I got careless, didn't uninstall it before putting 3 on, and I never have managed to get the desktop integration working. I'm not sure how to cleanly uninstall everything, but keep my config files!, and start over. sudo apt-get --purge dumps everything, --remove doesn't seem to dump enough. It'd be nice if Sun moved into the 21st century and established a repository Ubuntu users could add to Synaptic, or at least started providing .deb files that installed, including desktop integration, with one click, like Firefox! But one question: Does it create an entry in C:/Documents and settings/... or read/modify an existing entry? None of these methods should touch "C:/Documents and settings/" during installation, but most do during application usage. I think the exception is Method 3 (Portable OpenOffice.org) which modifies OOo to write its settings elsewhere. Almost worked... On the very last step (running the .bat file), I got 'Error 1925. You do not have sufficient privileges to complete this installation for all users of the machine.' I only have limited access to the machine (my user's folder, including the desktop). I also tried installing to a USB drive so I could drag it to a better location afterward. Any ideas? I'll probably just use Method 2.
msiexec.exe /A openofficeorg23.msi ALLUSERS="" and it will work. I used method 1 with OOo 3.1 so I could do an install without admin rights. However, that doesn't work. I did include the ALLUSERS="" option, so the install went ok; but when starting any program, the message about the configuration error appears. Gidi: What if you copy msvcr90.dll to the \program\ directory where soffice.exe is? still the same... I think it needs all the stuff in winsxs as well. For those having problems with the network install not working, it is most likely because the msvc*90.dll's are missing. In the OpenOffice.org initial download, after the files are extracted look in the installation folder for a folder called "redist". This is to install the c++ redistributale's. This will fix the missing dll's. Richard, indeed, the msvc*90.dll libraries are not installed on this public computer. (It has older versions, up to 7.1); however, I need administrator rights to install the package (vcredist_x86.exe) included in the "redist" folder that you mention. Copying the .dlls to C:\windows\system32 doesn't work (Access denied). "error 1925. You do not have sufficient privileges to complete this installation ........"
and the program is not installed. Before it I tried to install using the method described for OOo2X. There it could install but could not run.